How the son of an Malaysian immigrant rose to stardom within Ireland’s top sports divisions. Lee Chin could quite possibly be the modern successor to Setanta (the given name of the Irish mythological figure Cú Chulainn). His athletic prowess in hurling, soccer, and Gaelic football has been made legend in Ireland and, in February, will become Ireland’s newest mythological export as Chin and Wexford’s illustrious manager, Davy Fitzgerald, come to New York to spread the gospel of Wexford hurling. Chin’s father, Voon For Chin, emigrated from Malaysia to Ireland in the 1990s. Ireland then wasn’t the multicultural country it is known as today, which, according to Lee, led to some difficult times for his father and, later on, in his own life as well. Chin grew up like any other child in Ireland, playing Gaelic games and soccer around his neighborhood. He developed a voracious appetite for sport and cites three players as major influences on his no-nonsense style of play: Larry O’Gorman, Darragh Ryan, and his biggest sporting hero, Kilkenny’s Tommy Walsh. Watching the passion and determination these men had for their games inspired Chin to be the best he could be in his three preferred sports: soccer, Gaelic football, and especially hurling. This special love for hurling led him to join his school team and he eventually became a dual player in 2009, joining the Faythe Harriers for hurling and Sarsfields for Gaelic football. That year was a pivotal one for Chin, marking the beginning of his semi-professional club career and his first appearance in the Interprovincial Hurling Championship. Two years later, he played for the Wexford Bohemians, a soccer team that played in Ireland’s First Division and would transfer to Wexford FC in the same year. This would not be the last time Lee would make a splash in soccer. As his hurling skills progressed, Chin was touted as one of the best rising hurlers in the country and was soon selected to play for Wexford at the under-21 level in both hurling and Gaelic football. Though obviously a great achievement for any player with ambitions to become a senior county star, Chin’s early experience in the league saw him targeted because of his racial background. Chin, though shocked and extremely saddened by the incident, looked to the future of Ireland’s population that come from foreign lands, as he wants those children to enjoy the Gaelic games that have brought him so much joy and success: “I am speaking out about this to try and make sure younger G.A.A. players don’t have to face this.” A year later he and the rest of the “Yellow Bellies,” as Wexford athletes are known, won the Leinster Championship, beating Kilkenny by a goal. While 2013 led the rising star and Wexford to win its first under-21 Leinster final in 11 years, it also led Chin to a trip to the United States. Chin, alongside several all-star hurlers, made the journey to what many call the collegiate hub of Irish America – the University of Notre Dame. This trip was to promote a new, Americanized version of Ireland’s warrior sport called Super 11s. The game, recently created by the Gaelic Players Association, would be played with a baseball instead of a sliotar (a slightly smaller ball with raised stitching), consist of four quarters rather than two halves, and radically change the scoring system by discontinuing the use of upright posts and corresponding field goal points, instead awarding variable points – based on a scorer’s field position – only when the ball passes through the traditional guarded goal. While Chin enjoyed playing at Notre Dame, he explained his unease about the new format when I asked him about it recently. That trip prepared Chin for the next three years of intense competition as he would go on to impress both hurling and soccer fans in 2016 and 2017, as well as make another transatlantic trek – this time to Canada. But first, soccer. In 2015, a local soccer club called the Wexford Youths won the Premier Division, but due to injury and a loss of players, they were in a fight for their lives as they desperately wanted to stay within the top division. So in they called Lee Chin, the county’s best all-around athlete, to join their ranks in an amateur position in September 2016, just until the hurling season started. A month later, the Youths were in a two-game playoff against Drogheda United that would determine if they would remain in the premier league or be relegated to the second division. Chin made his presence known in the first game, sending home a masterfully-taken volley to ensure the Youths a 2-0 lead going into the second match. But before the final match, Chin’s first sporting love called him for another purpose – the G.A.A./G.P.A. All-Star Awards. Chin was nominated for his previous year’s efforts for Wexford and was determined to attend no matter what, even if it meant missing the Youths’ final game, likely making his triumphant volley his swan song for soccer, which he no longer plans to pursue. But when one locker room door closes, another opens, and in 2017 Chin was brought to a new sport altogether – ice hockey. As part of Allied Irish Banks television program The Toughest Trade, a show where the top players of the Gaelic games trade places for a week with the top players of other international professional sports like baseball, soccer, and American football. Chin believes he was selected for the hockey section of the program because of the difficult technical nature of the game. “I think it was going to be the most technically difficult sport to do. And considering that I dabbled in a lot of sports in the past, I might adapt to hockey pretty quickly.” Of course, Chin would take the chance to go to Canada and play hockey, as not only was he a fan of the show itself, he relished the new challenge. He was sent to the Vancouver Canucks to train and was given the daunting assignment of scoring a goal at the end of the week in an exhibition match with the Canucks’ alumni team. Chin had only one ice skating lesson before going to Vancouver and he was noticeably shaky as he took a couple spills on the hard ice. After his first skating lesson, he was forced into the fire, training with highly skilled players who had signed NHL contracts. The whole thing made Chin feel a bit overwhelmed. After some specialized training sessions from coaches and some legendary former NHL stars, Chin was getting better and better each session. When the hour finally came for Chin’s game-day debut at the Rogers Arena, he was as ready as he’d ever be. He had a good performance for a novice, despite falling the first time he touched the puck. At the end of the day, he had six shots on goal, two of which hit the post, but no points scored. Even though he didn’t accomplish his mission, he did find a new appreciation for hockey and the city of Vancouver. While Chin’s performance on the ice was not the best, his best performance was still to come in 2017. 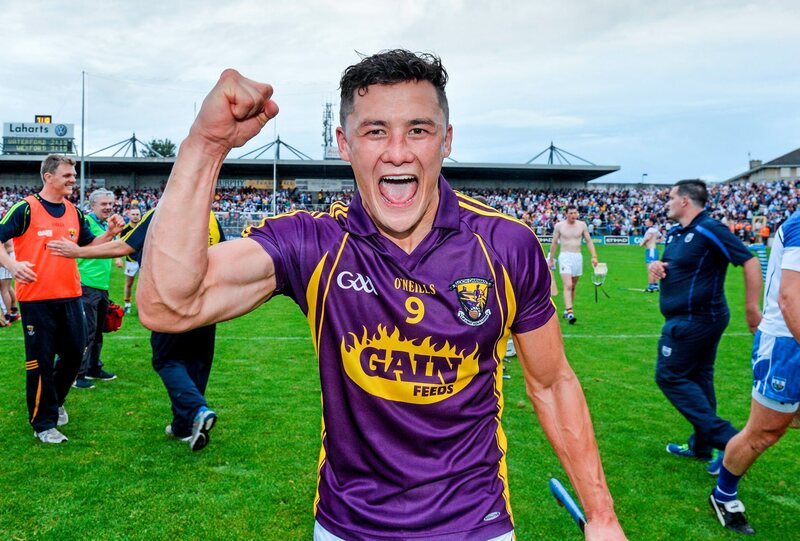 In June, Chin led the senior Wexford hurling team as he went on to score six points against the mighty Cats of Kilkenny in the Leinster Hurling Championship’s semi-final, which brought the team to its first Leinster hurling final in nine years. This year, Chin and Wexford have already won their first piece of hardware, beating Kilkenny again in a thrilling final in which both teams were even at the end of extra time with a score of 1-24 to 1-24. This led to the first ever shootout in the modern history of the sport. Wexford came out on top, scoring three out of the five shots taken. This undoubtedly portends well for Chin and the 2018 inter-county season, but before that can begin, Chin will take one more trip to this side of the Atlantic. This month, Wexford’s star and famed bainisteoir (manager) Davy Fitzgerald are coming to the so-called “Exile County” – New York City – to look for support from Wexford fans for this upcoming season and create sustainable fundraising partnerships with Wexford diaspora and for the greater G.A.A. community within the New York metro area. Chin and Fitzgerald will hold training sessions for the youth of the Rockland G.A.A., just north of the city, and the Shannon Gaels, based in Queens. “I’m just looking forward to meeting new people. This is one of the advantages of the G.A.A., that I can go to New York and meet another Irish community, another Irish connection, to other G.A.A. clubs on the other side of the world and see what hurling has done for them while they’re living here. Hey, I served in Vietnam with a guy from Rahway, New Jersey. We lost anyway. Should have stuck with the great game of hurling at Ring College. I would have used the word “modest’ instead of humble. Humble people have low self-esteem. The modest are just not braggarts. Hard to believe a non-ice-skater can begin with the pros!